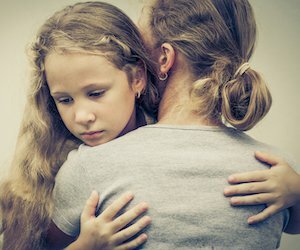 Single motherhood comes with a unique set of emotional challenges that can, at times, feel overwhelming. "It's like hiking the Appalachian Trail with a heavy backpack," says Amelia Shaw, an American mother of two young daughters living in Tijuana, Mexico. "The backpack has your essential stuff in it and weighs you down sometimes. When you take it off (say, by hiring a babysitter), for the first half hour you feel light and free. And then your body starts to crave that weight, and you feel anxious until you can put it back on." The challenges you face as a single mom – from self-doubt and anxiety over money to the stress of making decisions alone – are best understood by women who share them. Countless other moms grapple with exactly the same issues, and they've come up with some creative solutions that may work for you too. "There is no out. Being on 24/7 means that there is no one to pass the baton to when you are having a bad parenting moment (or day)," says Shaw, "and this can lead to parent tantrum-ing." "I've learned to not care so much about the little things," says Shaw. "If the kids come in all wet or scribble with my lipstick on the couch, I try to train my first reaction to be a laughing sigh, or the word "hurraaaaaaaay" (even if it's sarcastic), or some other facial or vocal reaction that is not anger. If I can't do that, then I try to say to myself, 'I am stressed out about X right now, and it is negatively affecting my ability to parent' as a way to distance myself from the stress." "It's so hard to know if you're doing a good job," says Cavaricci. "When you're in a couple, you have someone who agrees (or disagrees) with your methods and can help you see the merit in your positive parenting moments and help you improve where you fall short. But as a single parent you have to do that alone, and it's not always easy." "What really helps is to surround myself with other mothers of young kids," recommends Cavaricci. "I see where they fall short and learn from that, and I'm inspired by the things they do well. At the end of the day, I remind myself that no one is perfect. I know I'm doing at least something right because my daughter is happy and thriving." "Take a deep breath, cry if you have to, then get up and be the best mother that you know how to be." "I used to get extremely stressed and anxious over making all the decisions on my own," says Annie Tumlin, 35, mom to a 12-year-old daughter and two sons (8 and 6 years old) in Overland Park, Kansas. "Whether it's what type of lawn mower to buy or what school to send the kids to. I could ask my parents or friends [for advice], but I am the only one completely invested in my children." "I try to remember that nothing is that big of a deal as long as I support and communicate with my children," says Tumlin. "Over time, I've learned to trust that things are all going to work and to see the decision-making as an honor. Sure, there are always questions, but overall, being forced to have this responsibility has made me a better person. I have found confidence and independence." "This can be looked at as a positive thing. No negotiating with others when the decision is your own. If it's your weekend with the kids, you decide if you want to go camping or take a quick trip out of town." "Loneliness is a constant challenge, and the hardest part has been getting used to being without the kids," says Elizabeth Nelson, 39, mom of 13- and 9-year-old girls in Brooklyn, New York. "The first time my kids went to their dad's for a whole weekend, it felt like all the air had been sucked out of the room." "My solution has been just to plan out those times, so I don't give myself a chance to get into a funk," says Nelson. "I make myself reach out to friends and schedule nights out singing karaoke or going to dinner or whatever – things I can't do when the kids are home." "I've never received child support, and when my son was younger, I would get overwhelmed," says Julie Principe, 38, mother of an 18-year-old son in Bristol, Rhode Island. "At night, I'd be washing dishes, and my eyes would be swelling with tears, but I didn't want my son to see those moments of weakness because I didn't want him to have to worry about stuff like money." "I tell myself that as long as we have food on the table – even if it's just beans and escarole – we're OK," says Principe. "And from the time my son was 2 years old, I made sure I got exercise four to six days a week – even if it was at home, in the morning, or after bedtime. Exercise makes me feel less stressed." "If you write out a budget for the month, it helps you see where all your money is going and needs to go." "I was raised in a single-parent household, and I didn't want that for my child," says Komba. "I thought about all the things I missed out on as a child as it relates to having an absent father. I constantly worried about how my child would deal with knowing his father wasn't around." "Something that helped a ton was preparing myself mentally for the questions my child might one day ask," says Komba. "I thought about every possible question or scenario and prepared. I never wanted to be caught off guard. I didn't worry myself over these things, I simply prepared." "There is no longer a cookie cutter definition of a family. Family is what you make it. It can include friends who are like family, partners. Embracing that idea is the first step to embracing the family you have." "We are often expected to be superwoman when the other parent is not involved," says McClain. "After spending the day working full time, and then being on Mommy duty at home, it's easy to forget about taking care of yourself." "I suggest taking at least one hour out of the week to do something for yourself," recommends McClain. "It could be going for a walk or writing in a journal – just something that allows you to reconnect with who you were before you became a mom." "I put the baby to sleep and no matter how tired I am, I open myself a beer and paint, or I stretch canvases, or I sketch anything and everything. Sometimes it's worth leaving the housework for tomorrow." Do Laws on Postpartum Depression Screening Help Women? Are You Being Verbally Abused?